Moray Towers is a multiplayer stage in Splatoon and Splatoon 2. 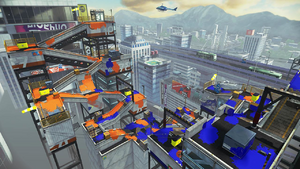 Moray Towers takes place on tall buildings that are connected by roads. It is a very vertical stage, with zigzagging paths leading down to the center area. Moray Towers consists of two large towers connected by a series of diagonal ramps on smaller towers. It includes two Spawn Points on opposite towers, meeting together in the center through a network of ramps. Although the large amount of ramps provides an easy way to ink turf, players may also jump from ramp to ramp for a quick route to the center. Many of the towers here contain parking garages. The Center Area is located between both teams' Spawn Points. It can be reached by traveling along a series of ramps, or more quickly by jumping over the ramps' edges. Due to the bottleneck nature of the ramps leading from the middle, it is a bit difficult for teams to advance past the center area. Unless teams are able to invade the other team's base and hold them back, matches are often decided by which team can paint more of the middle in the last 5 seconds of the match. In Splatoon 2, the overall map layout is relatively unchanged, however the central area has been expanded with the cap between the ramp on the lower area and the enemy's floor filled in as well as the addition of more room at the end of each team's alley. 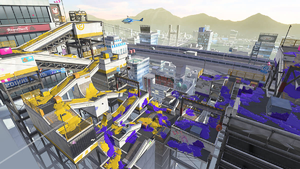 Most notable two Inkrail have been added on either side of the map, one at the end of the alley in the central area designed to give another point of access to the opposing team's side and another from each team's lower floor which takes then up the ramp. There are two Splat Zones on Moray Towers, both being on the ending part of the ramps closest to the center. They are the smallest splat zones in any level in the game. In Splatoon 2, The location of the two Splat Zones have been changed, both moved to the central area of the stage making taking control of both zones significantly easier. The Tower can be found directly in the center of the map, on the small, raised platform. It makes its way over the center area, above a chasm, and finally, into its goal on the section above the second-lowest ramp. The sides in the center area retain the smaller design from the old layout, but the walls are still added from the other modes. The first checkpoint will be located at the end of the alley on the bottom most area. The second checkpoint will be located on the platform one level below the goal. The Rainmaker in Moray Towers starts in the center of the map on the small incline. The goal is located below to first big drop off outside of the opposing team's base. Changes to the layout in Turf War to match the layout in Splat Zones. The map of Moray Towers in Turf War before update 2.6.0. Callie and Marie announcing the stage for North America. An Inkling near the enemy's base. An Inkling running up a ramp. An Inkling squid Super Jumping. Another Inkling squid Super Jumping. Moray Towers shown on a screen outside Inkopolis Tower. The battle is commencing in Moray Towers. An Inkling with a Blaster is descending the tower. An overheard view of Moray Towers. Jellyfish hanging out by a car. The view from Moray Towers. Cars seen from Moray Towers. A road near Moray Towers. A parking machine in Moray Towers. A 3D sketch of Moray Towers. An overhead sketch of Moray Towers. Concept art of different locations. "Parking" is an early sketch of Moray Towers. A bird's-eye view of Moray Towers. Moray Towers returned to Splatoon 2 at the game's launch. The center of the map has been slightly expanded and modified, while the towers themselves are wider. There are also the additions of new Inkrails that travel over the center of the map, and lead to vantage points. It is also used in Octo Canyon mission 21 "Octolings Ahoy!". Moray Towers in Splatoon 2. Moray Towers after changes were made in version 2.1.0 of Splatoon 2. Moray Towers during the day in Super Smash Bros. Ultimate. 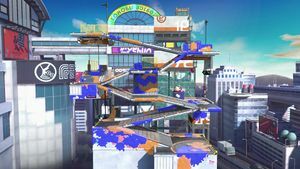 Moray Towers is the basis for a stage set to appear in Super Smash Bros. Ultimate. Judd and Li'l Judd make a cameo in the stage, indicating the winning player or team by holding up flags, similar to their results display in the Splatoon series. Moray Towers during the day. Moray Towers during the night. Judd and Li'l Judd on Moray Towers. The internal codename for this stage in the game files is "Tsuzura", either from 葛籠 (つづら), "Bamboo cage" or from 綴 (つずら), a location in Fukushima. Moray Towers was initially shown in the first Splatfest promotional video. Multiple images and the layout of Moray Towers were revealed in a datamine of Splatoon's files before it was officially confirmed. The map's name is a reference to the real-life moray eel. Moray Towers is the third stage in Splatoon to have its spawn points not accessible by foot, after Saltspray Rig and Kelp Dome. The Squid Sisters' conversation about Rollers and Chargers is a reference to Pokémon. During one of the Squid Sisters' conversations, Marie partially mentions that the fog is the result of draw distance, breaking the fourth wall. During Splatfest the buildings around Moray Towers have lit up windows and signs. As of Version 2.6.0, Moray Towers uses the Splat Zones version for Turf War which includes more platforms, ramps, and walls letting players have much more space to move around in the center, making sniping harder, and falling off the towers more preventable. ↑ Nintendo America on Twitter. Nintendo of America (2015-07-11). Retrieved on 2015 July 11. This page was last edited on 26 February 2019, at 16:36.